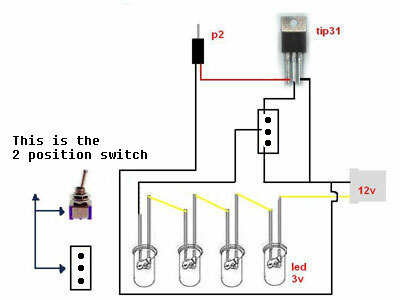 "Listening to music on my pc (proudly using WINAMP), I was wondering how would be to have some leds blinking with the sound that came out from the P2 connector, so I decided to make a simple circuit to do that. It worked pretty fine, so I decided to write a HowTo telling step-by-step how to do it. Hope you enjoy it!" So it is pretty much a transistor with the audio out controlling it? i like it. I think it would be cool to have different colors for each channel, like red for right and blue for left. Ok�I need to clarify a few things first. The P2 plug is just like a headphone jack? And plugs into you computer? And the TIP31 goes where? Other than that i understand the setup. Also depending on what that all does, can it plug into a MP3/CD player? Can someone PLEASE answer my questions?!?!!? I wasn't the one who made it but I will attempt to answer your questions. Yes P2 is a headphone jack. The Tip is the large 3 pin device and is physically wired as shown. Driving a few LED will not make it get hot so you can mount it where you like. Right, you could run this off a 9 volt battery also if you used LEDs with different voltages (or fewer LEDs). One thing that I would add is a series resistor with the LEDs though. Have a look here for LED voltages, click the link at the bottom for ways to calculate the required series resistor. Ok....good idea, go with 3 LEDs (3v) instead of 4, but would i still need a resistor if i did have 3, 3v LEDs? Thye voltage matches up. And if i did where would i stick that resistor. Somewhere along the + side? Yes you still should install one, it would go in series with the LEDs, so basically remove one of the wires colored yellow and replace it with a resistor. Ok I did this project and all i get is a switch that turns the lights on and off. Its shown without the battery, and a little messy, but tell me if you can see if the wiring is right. I can't really see what wires connect to what pins etc. can you take some more detailed pictures? Possibly, but while I get better pics, clarify this. What plugs in your computer and where would this be located? I cant figure this whole thing out. I am more confused than ever, and made this whole circuit just to fail. Thanks. Ok, but if I stick it into the Audio (headphones) jack would it still work? Cause thats what I tried. And I was a little confused about the circuit, because I have P2 going to the right pin of the tip and the left pin going to the battery wire (-). And the middle pin going to the switch's left pin. Well I have the Jack coming out with a black and red wire. The red going to the right pin and the black going to the - battery. Ill try what you said and see if I can make any progress.